Hopefully this title isn’t wasted on you. A brief musical interlude, as Sunday saw me back at in That London for my fourth gig of the week (a sure sign of middle-age crisis, that). In general I steer well clear of gig reviews on here, but the last week was particularly notable, and I’m hearing more live music than ever these days. Three of those gigs were in legitimate pubs, albeit Gorilla, the Waterman and the Lexington are firmly in the modern bar/club/diner mould. Russ made an interesting point* about plastic glasses after my Palace post. The larger and more corporate the venue, the less chance you have of drinking your beer out of a glass rather than plastic. And as you know, a pint glass is the only retiredmartin approval vessel for the consumption of beer. Of course, you can’t even take your beer to your seat at the Etihad, as numerous Italian football tourists findto their cost when being evicted. 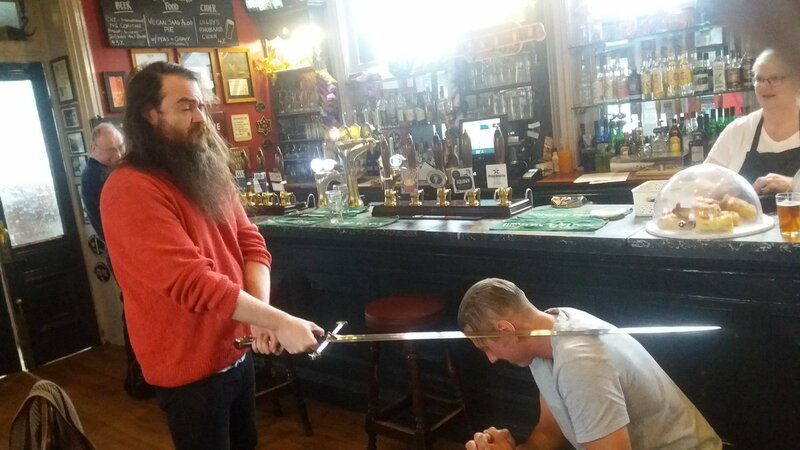 Some pubs in the North-West even allow you to take your own sword in them. Just an average day in a Northern pub. Photo by Matthew Lawrenson. Mrs RM came with me to the first three gigs, which either means her musical taste is expanding beyond Chris De Burgh and Elgar or the WiFi is better at gigs than at home. She particularly enjoyed Aldous Harding at Gorilla, especially the bit where my phone beeped and I was viciously stared at by a silent crowd. One of the gigs of the year, or it would have been if she’d played “Horizon” . Great venue, and Beavertown on keg in plastic glasses. While Mrs RM enjoyed that, I nipped outside to the closest GBG pub to enjoy a proper pint of Brewsmith in FONT. Despite my “I am NOT a CAMRA member” T-shirt (grey, XL) I was immediately offered a 50p discount by a nice man in a Stone Roses T-shirt. Back in Cambridge two days later for David Thomas Broughton at the Waterman, watched by a full house of about 30 in the outside Potting Shed. DTB, as we know him, is what you might call an idiosyncratic live performer, making what we might call weird folk if we had to give labels to music. For context, David comes from Otley and resides in Pyongyang. Otley leaves its mark on you. Just £6.60 for a masterclass in performance art, and I got to buy actual vinyl from the great man. On my day off the demon drink, Mrs RM had the pleasure of the demon keg. Can’t remember what she had, but it would have been the strong ones on the board below, probably the Nene Valley Dubbel and the L&G Marzen. Not bad for Cambridge. Thursday brought the only non-pub gig, at the rather staid Junction, and the only relatively well-known name in Lucy Rose, who was one of the saving graces at Latitude this year. The Cambridge middle-class out in force for this one (says he). Mrs RM drew the short straw, with a pricy bottle of local Moonshine Trumpington poured rapidly into a plastic glass not presenting the beer at its best. At half time I nipped out and bought her a can of Stone IPA from the Tesco Express opposite. Which brings us to last Sunday, and Mammoth Penguins at The Lexington. Probably the best place in the capital to hear new music over a pint in a glass, and not quite as terrifyingly trendy as the competition in Shoreditch and Hackney. Not the greatest cask line (Hobgoblin, Deuchars, Sambrooks), so I go for the one with the impressively large tap handle, just like the rest of the under-30s in the downstairs bar do. Mega Emotion. They’re from Norwich, you know. and Cambridge’s own Mammoth Penguins, who play their gorgeous new concept album about a bloke who fakes his own death. The best live band from our fair city since Nutmeg. Lots of good music and decent beer, and a rare opportunity to see old and young on licensed premises at the same time in 2017. I trust this round-up will either reassure you that the current music scene is vibrant or convince you to stick to your Rush box-set. There’s that bloody plastic again. “Lucifer over Lancashire” is a track by the Fall of the first picture. I’m not sure the Fall’smusic translates to Canada ! Mrs RM likes Elgar ? You lucky sod. Mrs Professor Pie-Tin ( an innocent Irish colleen ) has limited knowledge of classical music and to be honest it’s not the reason why I married her.If you must know it was her Daisy Dukes.The tightest I’ve ever seen – and I’m quite the connoisseur of tight Daisy Dukes. But she knows of Brahms since I told her many years ago it was Cockney rhyming slang for getting pissed. To this day as she cracks open the second bottle of red after dinner she’ll exclaim ” let’s get fackin’ Brahms my son ” in the accent she knows off by heart from years of watching Eastenders. Little does she know – and this is the God’s honest truth – it is written in my will that Elgar’s Nimrod will be playing as my coffin is sliding towards the roaring furnace. It’s the greatest piece of English music ever written and brings tears to my eyes every Remembrance Sunday. Mrs RM is an accomplished cellist. Goodish version of Cello Concerto but not so good on Dream of Gerontius. Rather distressed to read you drink wine, sounds very French. I’m with Syd on not touching French muck. Argie Malbec for me, with steak and fries. Loved the line “or the WiFi is better at gigs than at home.” Too long since I’ve been to a live show, I’d really better get to one soon or my music fan credentials will be revoked! Was going to write “the ghost of Brian” but then realised he was still with us !